The Nicholas Colby Fund® provides backpacks to children with cancer at children's hospitals. These backpacks contain 10-15 items as well as a Nicholas Colby Fund® T-shirt and Nicholas Colby Fund® bandanna. The backpacks are being phased into children's hospitals: Children's Hospital Oakland, Stanford-Lucile Packard Children's Hospital, and the University of California San Francisco-Children's Hospital. And children with cancer at other hospitals receive Nicholas Colby Fund® backpacks. Through partnering with the Gabby Krause Foundation out of Colorado (Nicholas was at the children's hospital in Denver, Colorado for a few weeks in April/May 2006), Samsonite provides backpacks to The Nicholas Colby Fund® and The Nicholas Colby Fund® provides the items to go into the backpacks. Collaborating with organizations ensures the Nicholas Colby Fund® has a ready supply of products for each backpack. A couple of initial partners on this effort have been Games Unlimited - Danville and Papyrus - Lafayette. The Nicholas Colby Fund® provides nutritional packs to pediatric intensive care units (PICU) at children's hospitals. 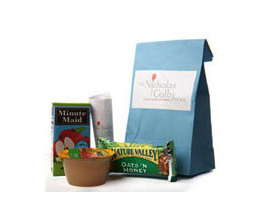 These packs contain juice, granola bar, applesauce, and a Nicholas Colby Fund® note of love. 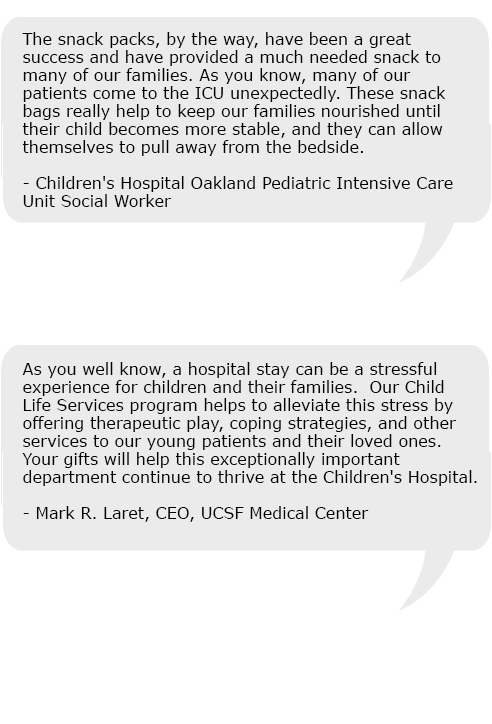 They are on-hand and available 24/7 to parents or guardians of a patient in the PICU at Children's Hospital Oakland and UCSF Children's Hospital. Collaborating with organizations ensures the Nicholas Colby Fund® has a ready supply of products for each nutritional pack. A couple of the initial partners on this effort have been Diablo Foods - Lafayette and ADMAC Digital Imaging - Emeryville (collateral and other logo related services).